Spectral Dynamics Inc. has been delivering multi shaker control (MIMO) systems since about 2001. Over this time the requirements for additional output Drives has grown steadily as 3 DOF and 6 DOF testing gains in popularity. We now offer up to 24 controlled Random Drives in a single standard system and these capabilities are described below. The vibration testing of large structures has evolved over the past few years as several factors have converged to create a possible “Perfect Test” scenario. 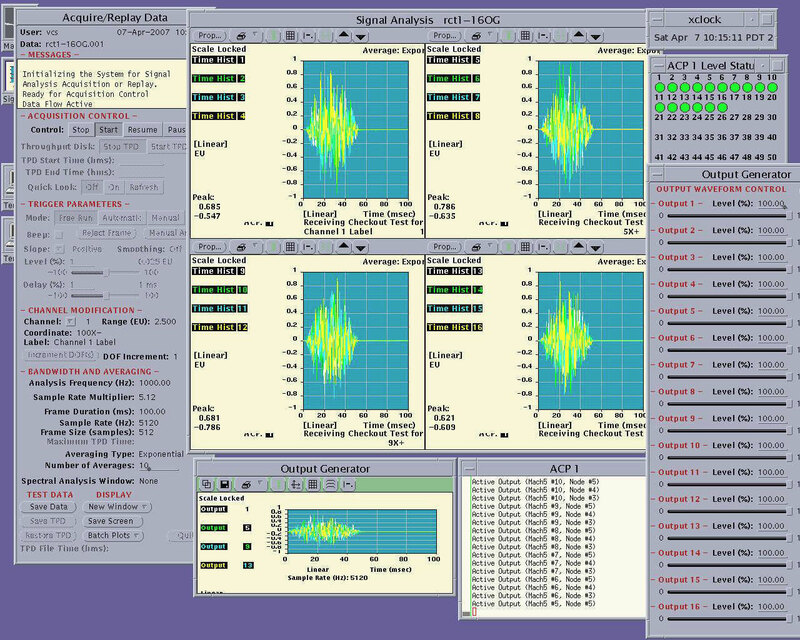 The introduction of MIL-STD-810G in October, 2008 for the first time both gave emphasis to “Multi-Exciter Testing” and included a separate section on Time Waveform Replication. Also, for the past several years an increasing number of technical papers have been presented on various aspects of Multi-Exciter (MIMO) testing. These have included both fundamental presentations, exploring various new testing methodologies and many practical reports showing the results of performing many different kinds of MIMO tests. Some of these have also included the use of measured field data as the basis for the laboratory Multiple Input Multiple Output (MIMO) test. The realization that a single, very large, shaker is not always the most effective way to test a large or unusually shaped structure has contributed as much as anything, to the increasing use of multiple, smaller shakers to perform very realistic testing. It has also been shown that by describing a complex, multi-exciter test setup in terms of a Spectral Density Matrix, all of the critical system parameters can be seen in a compact, efficient formulation. By repeatedly solving this matrix during a test, realistic simulation of non-linear events and test systems is now possible with great precision. So whether it is a satellite, a long missile system or a multi-layered circuit card, many test articles can now be tested with greater precision than ever, using a MIMO approach. An example of an 8 by 8 Spectral Density Matrix (SDM) used to describe a system with 8 exciters and 8 control points is seen in figure 1. This could be an example of “Square” control in which the same number of Drives and Control points is used. 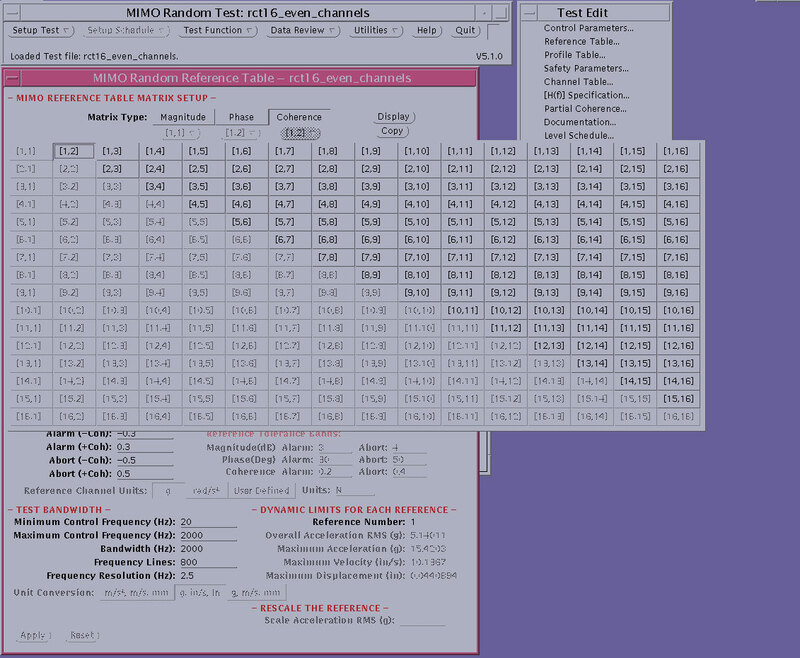 In this case figure 1 shows the 2 types of 8 X 8 matrices which are created in a Spectral Dynamics MIMO JAGUAR system when running a controlled MIMO Random test. In the matrix on the left, only the major diagonal elements are available. These represent the Control PSD’s at each control point. These are user-entered PSD profiles which may have identical or different PSD shapes and levels. The matrix on the right represents both the Phase and the Coherence profiles and separate matrices of the same order are presented to the user – one for Phase and one for Coherence profile entry. Note that only the upper off-diagonal elements are shown. Once the 8 major diagonal PSD’s and 28 off-diagonal Phase and Coherence profiles, in this case, have been entered, the system calculates the complete Spectral Density Matrix in terms of PSD’s and Cross Spectral Densities. In many vibration tests, the number of shakers and shaker Drives may not match the number of mechanical Degrees of Freedom (DOF) which the test is trying to produce and control. Many tests may be set up in an “Overdetermined” condition. For these cases, it is often necessary and desirable to transform the number of input signals, which will exceed the desired number of DOF’s in an Overdetermined case, to the desired number of Control Vectors. This is typically done using an Input Coordinate Transformation process such as shown below. In equation 1, four triaxial accelerometers were used and converted into control vectors representing X, Y, Z, Roll, Pitch and Yaw. The bottom 3 rows of the center matrix have conversion factors to convert from G’s to radian/sec2 using the geometry of the accelerometer placement for this determination. As a result of this process the outputs of the controller are the 6 desired DOF’s, including X, Y, Z, Roll, Pitch and Yaw. In order to drive the 6 exciters being used in the system described by equation 1, an Output Coordinate Transformation would be used. Some tests in which this configuration of 12 accelerometers is used to control 6 DOF with 6 exciters, are reported in Reference 1. As testing systems evolve into trying to more closely simulate real world environments, the number of exciters needed to perform these tests continues to increase. Recently several customers have introduced requirements to excite and control 16 shakers simultaneously. These include the need to control both Magnitude and Phase for MIMO Sine tests and to control Magnitude, Phase and Coherence between Control locations for MIMO Random tests. As shown previously in figure 1, to create a fully controllable MIMO Random test, the user needs to enter the desired PSD Characteristics at each of the control locations. For a 16 shaker test, these become the 16 major diagonal elements of the matrix shown in figure 2. Each of these elements is a defined PSD profile with up to 100 breakpoints. If field data is not being used and a 16 Drive Random test is to be defined in terms of a Spectral Density Matrix, the starting point is an SDM which looks like figure 2. Here the 16 major diagonal terms define Control PSD’s at the first 16 control points. The shape and level of the control PSD’s need not be the same for all control points. However, in many cases, Customers choose to create similar or nearly identical test conditions at many or all control points. This is especially true if some type of “Platform Motion” is required on part of the test structure. 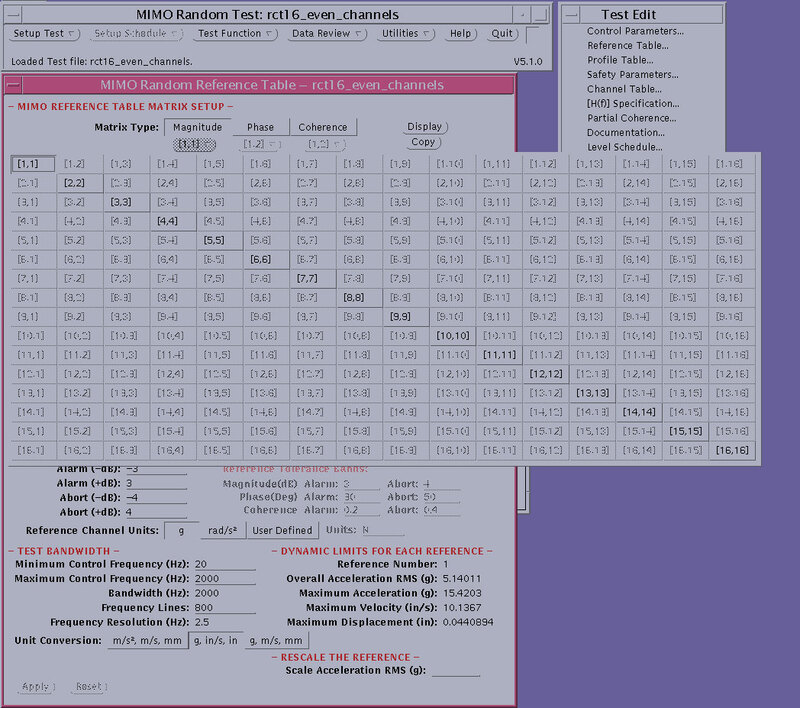 The JAGUAR MIMO control software shown in this discussion, includes a Copy function which simplifies the entry of multiple profiles for PSD, as shown in figure 2 or for Phase and Coherence profiles such as shown in figure 3. In the case of a 16 Drive configuration, the upper off-diagonal terms for Phase and Coherence each represent 120 individual profiles, all of which will be controlled in real-time! So the Copy function is quite well appreciated. Many tests, including Modal tests, require multiple shaker excitation. In these tests the excitation may be uncontrolled, open loop. Burst Random excitation is very popular for generating Modal data since analysis can be performed in most cases without the use of a Weighting Function since the signal will usually decay within the measurement frame. Note the incoherent Random waveforms in the burst signals shown. If multi-exciter, single frequency, Sine excitation is used it is often necessary to independently adjust each Drive in terms of Magnitude and Phase at a common Frequency. Figure 5 shows an example of setting 4 independent Sine Drives, all at 10.30 Hz. Note that Frequency may be set to within 0.01 Hz, Phase for each Drive to within 0.01 Degree and Amplitude to within 1% of full level. Up to 16 Drives can be set in this manner. Excitation can be Sine, Random or Burst Random. Hale, Michael and Underwood, Marcos A.; “MIMO Testing Methodologies”; Proceedings of the 79th Shock & Vibration Symposium, October 26th – 30th, 2008; Orlando, Florida, USA. Underwood, Marcos A. and Keller, Tony; “Applying Coordinate Transformations to Multi Degree of Freedom Shaker Control”; Proceedings of the 74th Shock & Vibration Symposium; October, 2003; San Diego, CA, USA. Underwood, Marcos A. and Keller, Tony; “Rectangular Control of Multi-Shaker Systems; Theory and Some Practical Results”. Proceedings of the Institute of Environmental Sciences and Technology, ESTECH2003, May 19, 2003, Phoenix, Arizona, USA. Underwood, Marcos A. and Keller, Tony., “Understanding and using the Spectral Density Matrix,” Proceedings of the 76th Shock & Vibration Symposium, October, 2005, Destin, Florida, USA. Underwood, Marcos A. and Keller, Tony., ”Using the Spectral Density Matrix to Determine Ordinary, Partial and Multiple Coherence”, Proceedings of the 77th Shock & Vibration Symposium, October, 2006; Monterey, California, USA. Keller, Tony and Underwood, Marcos A.; “An Application of MIMO Techniques to Satellite Testing”; Presented at ESTECH 2000, May 3, 2000 in Newport, Rhode Island. Underwood, Marcos A.; “Multi-Exciter Testing Applications: Theory and Practice”; Proceedings of the Institute of Environmental Sciences and Technology, ESTECH2002, May 1, 2002, Anaheim, California. Keller Tony; Maeda, Setsuo and Shibata, Nobuyuki; “A Rationale’ for 3-Axis Hand/Arm and Whole Body Vibration Simulation”, 14th Japan Conference on Human Response to Vibration, Kawasaki, Japan, August 2-4, 2006. Ayres, Russell; “Creating Coordinate Transformation Matrices”; Proceedings of the 78th Shock & Vibration Symposium, November 4th – 8th, 2007; Philadelphia, Pennsylvania, USA. Underwood, Marcos and Keller, Tony; “On Using Response Limiting Control During Multi-Shaker Testing”; Proceedings of the 78th Shock & Vibration Symposium, November 4th – 8th, 2007; Philadelphia, Pennsylvania, USA. Underwood, Marcos A.; Ayres, Russell and Keller, Tony; “Creating and Controlling Unusual Waveforms for Multi-Shaker Testing”; Proceedings of the 79th Shock & Vibration Symposium, October 26th – 30th, 2008; Orlando, Florida, USA. Lamparelli, Marc; Underwood, Marcos; Ayres, Russell and Keller, Tony; “An Application of ED Shakers to High Kurtosis Replication”; ESTECH2009, The 55th Annual meeting of the IEST, May 4-7, 2009; Schaumburg, Illinois, USA. Underwood, Marcos A.; Ayres, Russell and Keller, Tony; “Filling in the MIMO Matrix; Using Measured Data to run a Multi-Actuator/Multi-Axis Vibration Test”. Presented at the 80th Shock & Vibration Symposium, October 26th – 29th , 2009 San Diego, California, USA. Underwood, Marcos A.; US Patent # 5,299,459, “Adaptive Multi-Exciter Control System”; April, 1994. Keller, Tony; Maeda, Setsuo and Shibata, Nobuyuki; “Hand-Arm Vibration Test Bench”; Proceedings of the 11th International Conference on Hand Arm Vibration, Bologna, Italy; June 3-7, 2007.